Thanks to superior equipment, your driveway will be built better. Our unique technology lets us work with nature not against it! Cost to build Asphalt driveway – Are you looking for a reliable and dependable paving contractor in NJ? About McFarlane Paving, we have over 60 years of experience in providing our customers with high quality paving projects. Most importantly our professional paving crew creates custom designed driveways and parking lots that will not only enhance the curb appeal of your home, but will also increase the value of your home. When looking for a paving contractor in NJ, be sure to choose a company with a good reputation for quality. Look at some of our work in our projects gallery, then give us a call at 201-664-2696 or use our online free estimate form to contact us to schedule an appointment. 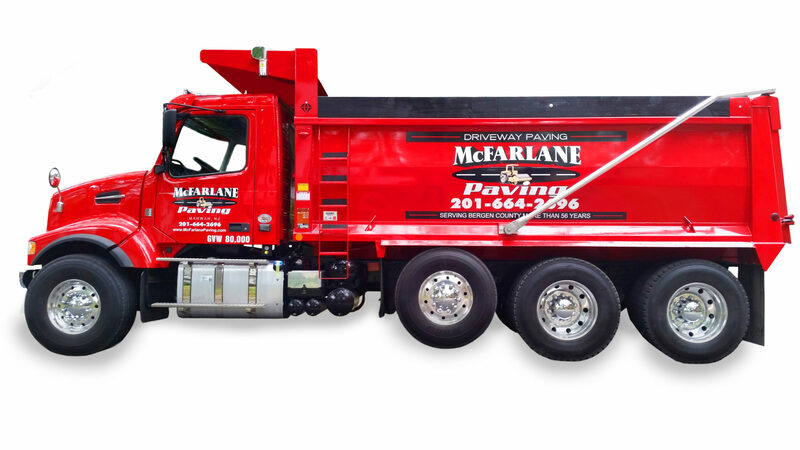 McFarlane Paving asphalt driveways uses only the best equipment to maintain quality control. We are always upgrading to assure that we are using the most effective and safest machinery available in order to maximize production. By relying on McFarlane Paving Asphalt, you can rest assured that everything is going to your plans. You have a name that you can trust! Contact us today when you’re looking for a quality asphalt driveway company in NJ. Must be on same street as neighbor. Must be started the same day! Mention Promo Code: Next Door Neighbor. Offer Expires when we leave the Neighborhood!